While wildlife refuges and other natural areas are important for conservation, recent research shows biodiversity on working lands — places where people raise food, forests, products or livestock — are important for wildlife and plants as well. In the review article, Kremen and her colleagues looked at a vision of earth in the future and what would be needed to conserve biodiversity. After reviewing the literature, they determined that working landscapes must be used and managed in a way that’s friendly to wildlife. “We feel this will be the way to conserve biodiversity,” she said. Kremen said working lands are especially important for certain species. While some might need virtually pristine managed ecosystems, many species can coexist with human activity, she said. Supporting these animals in working landscapes can give them more area to persist, especially species that traverse the landscape to migrate. These lands are also important to help establish connectivity between populations, enhance gene flow and help animals find new ranges in the face of climate change, she said. 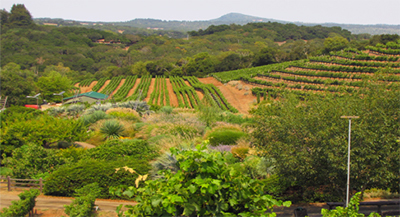 Kremen describes biodiversity-based methods as returning diversified agriculture to the landscape instead of single-grass pastures and monocultures of food crops. The big brown bat (Eptesicus fuscus), for example, can feed on crop-eating pests on American farms if they are attracted by more biodiversity, she said, but examples of biodiversity on working lands exist around the world. In Colombia, landscapes of degraded agricultural lands have been restored by planting pasture grasses and shrubs that feed livestock and put nitrogen into the soils alongside trees that provided wildlife and livestock with shade and places to hide, Kremen said. “These systems actually turned out to be more productive for milk and meat, as well as reducing greenhouse gas emissions,” she said. Forests can also be managed for biodiversity by growing trees of different ages, she said. Farms can also have temporal and spatial diversification of crops. Planting flowers can attract pollinators that benefit crops. Conservation programs, including some provisions in the Farm Bill, are in place to help put these in place, Kremen said. “Certainly, we have a big vision, but how to get there requires an all-hands-on-deck approach,” Kremen said. Dana Kobilinsky is a science writer at The Wildlife Society.